To make the muffins: Preheat the oven 350 degrees. Grease a muffin pan; set aside. Combine the flour, baking powder, and salt in a medium bowl. Add 1 tablespoon of the flour mixture to the raspberries, and toss to coat; set aside. In a large bowl, whisk the egg and the sugar together until the mixture is thick and thoroughly combined. Stir in the lemon zest until evenly distributed. Slowly whisk the butter into the mixture until combined. Add half the sour cream, whisking until just combined, repeat with the remaining sour cream. Add the flour to the sour cream mixture and fold with a spatula until the batter comes together. Add the raspberries and very gently fold the mixture until the berries are evenly distributed (do not overmix). Evenly divide the batter in between the cups of the muffin pan (about 3 tablespoons of batter per cup, for standard muffins, or about 1 1/2 tablespoons for minis). Bake standard muffins for 20-23 minutes (minis for 15 minutes), or until very light golden brown in color, and a toothpick inserted in the center comes out clean. Transfer the muffins to a wire cooling rack and allow to cool for 5 minutes before glazing. this month for secret recipe club i was assigned Amanda from dancing veggies . Her blog is loaded with quick and easy recipes that all look delicious! there were a ton to choose from. 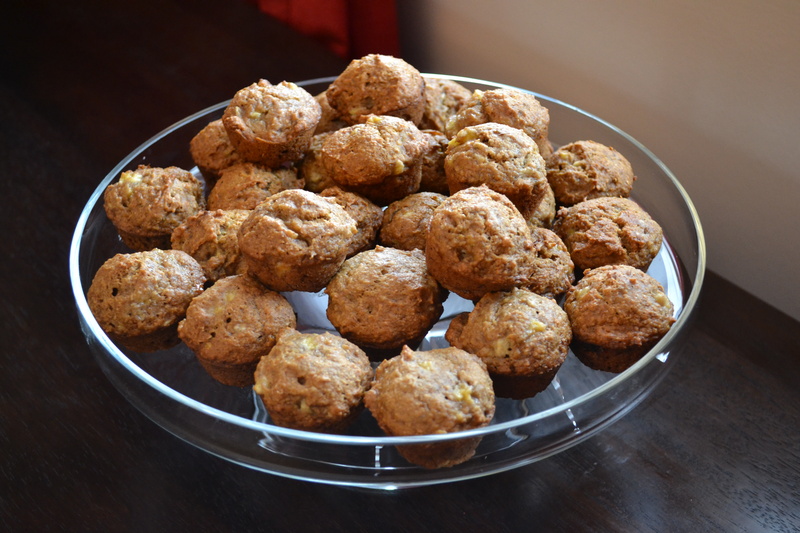 i had some bananas that were calling to be baked so i went with these banana muffins. i baked mine up in mini muffin tins. they turned out Delicious! not too sweet and easy to pop in my mouth 🙂 might try one with nutella later on! 2. In a large bowl combine flour, baking soda, cinnamon, and salt. In a separate bowl cream together butter and borwn sugar. Stir in applesauce, vanilla, and mashed bananas until well blended. Stir banana mixture into flour mixture; stir just to moisten. 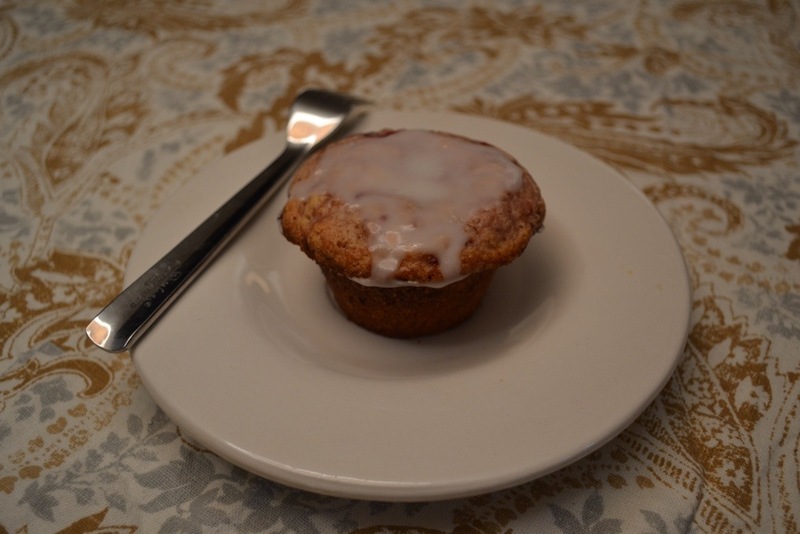 These muffins were super delicious so moist and lemony and blueberryish. YUM! I used the whole pint of blueberries we got in our fresh box! 5 tablespoons unsalted butter, at room temp. In medium bowl, sift together the flour, baking powder, baking soda and salt. In large bowl, beat the sugar, butter and lemon zest on medium for about 2 minutes. Beat in egg and vanilla extract for about 1 minute, until creamy and smooth. Beat in Sour cream until combined, about 1 minute. In two batches, sift in flour mixture and stir in until almost combined. Carefully fold in blueberries until just combined. With an scoop, fill each cup full of batter. Bake for about 20 to 22 minutes, until golden brown on the top and tester comes out clean. Allow to cool in pan on rack for 8 to 10 minutes. Place directly on rack over baking sheet. 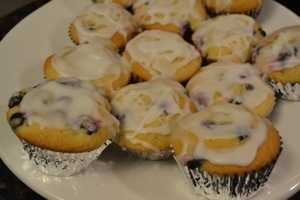 While muffins are warm, drizzle lightly with a small portion of the lemon icing — use only about 1/4 of the icing batch. Allow to cool completely. Drizzle remaining lemon icing over cool muffins. In small bowl, whisk together confectioners’ sugar, zest and juice until completely combined. Adjust consistency by adding a little more sugar to thicken or a little more juice to thin. my mom bought over a few pounds of cherries last week… We love cherries but it was ALOT of cherries!! These came out delicious but required a ton of work!! Canned pie filling will work just as well if you want to make this with less work! I also eh about the almonds, but would definitely make these again! Simmer first 3 ingredients for 10 minutes or until cherries are softened and mixture is liquidy. Stir together cornstarch and water; stir into cherry mixture. Bring back to a simmer and cook until thickened (1-2 minutes). Allow to cool while you make the batter. (This can be made ahead of time and refrigerated until ready to bake). the original recipe called for almond extract not vanilla, but I didn’t have almond so vanilla it was! Stir together flour, sugar, salt and baking powder. In a separate bowl mix oil, egg, milk and extract. Stir into flour mixture. Add sour cream and stir until combined. Spoon enough batter into 12 paper lined muffin cups just to cover the bottoms nicely. 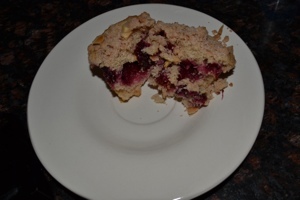 Divide cherry pie filling evenly between muffin cups. Top with remaining batter. Mix together flour, sugar, cinnamon and nutmeg. Mix in butter until evenly coated. 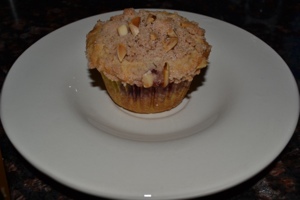 Sprinkle liberally on top of assembled muffins, along with almonds. Bake at 400ºF for 20 minutes or until a toothpick inserted in the centre comes out clean. Allow to cool 5 minutes before removing to wire racks to cool completely. 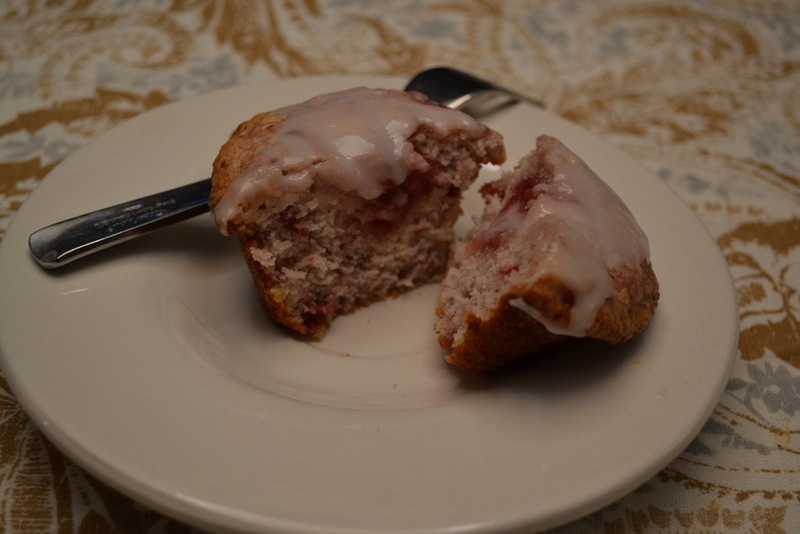 Made some really good zucchini cherry muffins. Check them out!